–fruit, crackers, and strawberry cream-covered pound cake, we were ready. I decided a tasting from lightest colored to darkest colored would be best, but I also had a hunch that the most adventurous of these wines, the 2013 Vin Gris Tuilé, needed to be last despite its adobe brick coloration. Boy, was that a good call! I’ll keep you in suspense for now. Randall Grahm has been making Vin Gris de Cigare rosés since well before the first time I sampled one in their tasting room, a few years after graduating from UCSC in the early ‘00s. It’s very light in color with the merest suggestion of a blush. Friend #1 thought it really good. Friend #2 felt it strongly reminded her of Jolly Ranchers. Friend #3 said, if he had to pick one of the four rosés to drink forever, it would be this one. $18, available most places you can find Bonny Doon Vineyard wines and here. Grahm’s tasting notes for this 69% tannat and 31% cabernet franc blend call it an “homage to the Middle Ages Cool style of clairet…while the Vin Gris de Cigare is intended for more sober-minded occasions, this is definite the less buttoned up in style.” That was apparent from the moment I poured a glass. A Proper Pink has a rich strawberry nose, so rich, I’d called it mulled. The mouthfeel is velvety and fleeting, a good combination. Strong strawberry notes please without coming across as sugary, a somewhat difficult feat. The wine lacks depth, but it has a mildly acidic finish I enjoy, the wisp of wet stones. 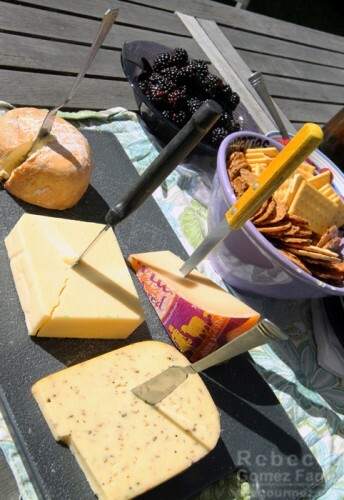 Of all the wines, it went best with the cheeses. Friend #2 found the finish rough and didn’t like the wine. Friend #4 thought it smelled how the Vin Gris de Cigare tasted,or like a mediocre agua fresca. It tickled the top of her mouth and ran off scared. Friend #3 enjoyed the nose but felt the wine itself did not deliver on that promise. Friend #5 thought it nice and smooth, especially in comparison to the 2015 Il Ciliegiolo Rosato. $16, available most places you can find Bonny Doon wines and here. This 100% ciliegiolo wine started out as a red, but the winemaker soon caught it blushing. Perhaps as a result, the wine is deep cardinal red. It smells of sweet flowers but is remarkably similar in flavor profile to A Perfect Pink, as long as you insert watermelon notes in place of the strawberry ones. The primary difference between the two is that the Rosato is flatter, yet more tannic. For me, it launches into the air from a lily pad but gets stuck mid-leap. As it dangles there, cranberry and granite notes come out, giving it more complexity. With some acidity, it might have soared. 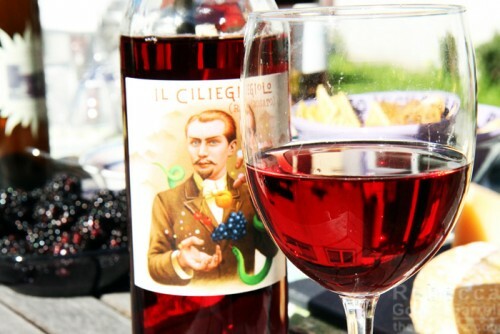 Friend #1 describes the Il Ciliegiolo Rosato as having a grassy, strawberry, and watermelon nose. Thus far, he thought all the wines would be good for serving to his mother — take that as you will. Friend #2 found that it grew on her, and she especially enjoyed it with a handful of blackberries. Friend #5 declared this to be her favorite and thought it had a good kick. Friend #3 suggested mixing a little of it together with A Proper Pink to make a better wine overall. All I’m saying about any such experimentation is that he may be onto something…$24, available only to wine club members. Become one, and you can order it here. And finally, the 2013 Vin Gris Tuilé. In terms of body, coloring, and an anything goes spirit, this wines reminds me a lot of that new hot ticket item, orange wine. 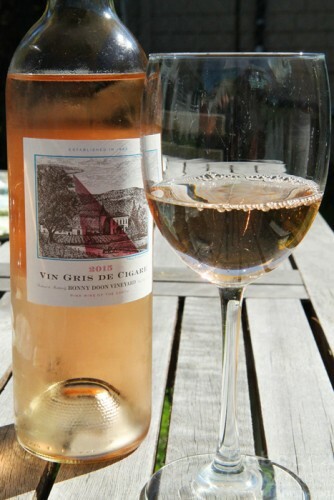 Vin Gris Tuilé calls the challenge of unconventional winemaking processes and doubles down by setting a blush wine out in full sun for nine months, letting ultraviolet radiation do the trick of killing microorganisms and producing a stable wine. It doesn’t look particularly like a blush to me when done. A strong smell of turmeric and pepper makes me 100% agree with the tasting notes that this a curry wine. The taste is more of a soft ginger with light citrus notes; think pineapple, yuzu, pomelo. Its finishes like a watery broth. Compared with the rosé options, it’s certainly not my favorite, but it is interesting. I’d like to try it again with a cooling yogurt-based Indian dish for contrast with the hot curry spices in the wine. Everyone had strong opinions on this wine, which is why I’m glad I placed it last! Friend #1 smelled musty mold and tasted a fennel finish. Pairing it with the semi-hard sheep’s cheese made it inoffensive, but he thinks it’s a wine that only people drinking purely for alcohol content will appreciate. Friend #3’s look of confusion said it all. He asked, “Is this wine?” and then compared it to a homebrew made in the basement. Friend #4 found the smell and visual off-putting but not the wine overall, though she wouldn’t buy it. Friend #5 posited that if bathtub gin could manifest as wine, this would be it. It also reminded her of mead, and she didn’t think it quite as bad as Friend #1. Not everyone leaned toward dislike. My husband arrived just in time to try it, and he thought it sherry upon first sip, which lends credence to the nuttiness listed in the official tasting notes. Friend #2 preferred it to all the other options. It reminded her of radishes and curry with a sweet finish. She helped me brainstorm the potential fruit notes I couldn’t put my finger on. Mangosteen? Rambutan? All potentials along with the citrus I listed previously. $20, online here. Otherwise for wine club members only. Friend #1: There’s a reason I drink cabernet. Friend #2: There’s a reason this one (the 2013 Vin Gris Tuilé) is my favorite. Friends #3–5: We aren’t really rosé drinkers. Me: WHAT?!?! You aren’t rosé drinkers? What are you people doing here? How did I invite you?! 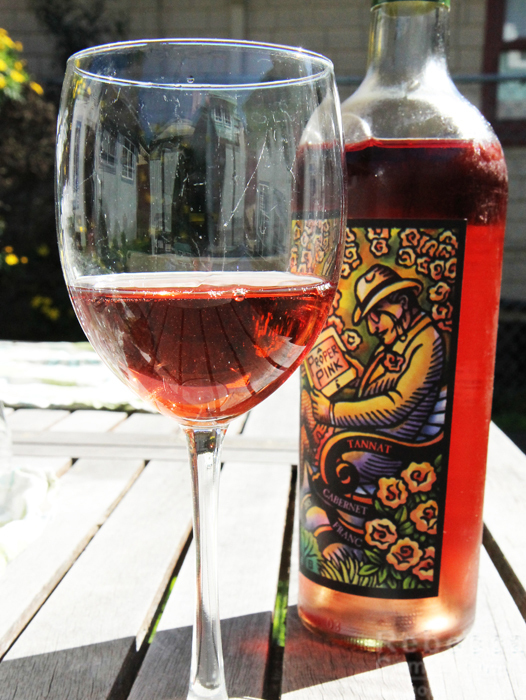 And also, the 2015 Vin Gris de Cigare continues to be an excellent choice from Bonny Doon Vineyard’s lineup. The 2013 Vin Gris Tuilé is meant for adventurers, so if you want a thrill ride that may bang you around a bit, give it a try. A Proper Pink 2015 and the 2015 Il Ciliegiolo Rosato both offer solid rosé profiles but do strangely benefit from being sampled in tandem. Or stirred together in a glass. Not that we would do such a thing. Or at least admit to it. 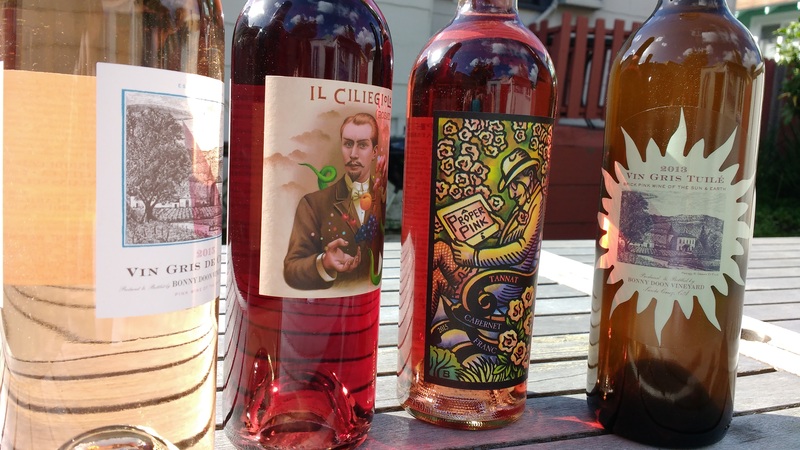 Thank you, Randall Grahm and Bonny Doon Vineyard, for this fascinating opportunity to give your lineup of rosés on sale for Spring 2016 a swirl! 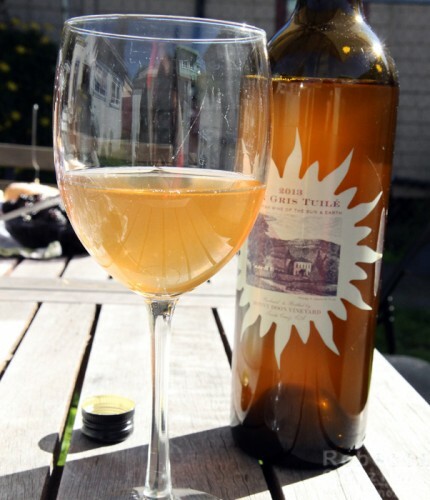 How have I not tried the Bonny Doon Vineyards Vin Gris Tuilé? Clearly, I need to get on that (or move to the West Coast so you can invite me over to these tastings). This looks like a fun line-up. This is the first year it’s been released, that’s how! It’s a crazy wine – have fun with it if you order! Definitely try it with Asian food. Hmmm. So they’re oxidizing the Tuilé. Doesn’t sound like my favorite way to go, but I agree it would be worth tasting with some Indian food. I’ve had the Cigare on several occasions and do like it. But that Rosato sounds really interesting – tannat and cab franc. Wonder what it would taste like as a red. I agree that it would be great fun to try a rose of the rosato along with one that had been taken to a full red anyhow. Would be a learning experience from the winemaker’s perspective!